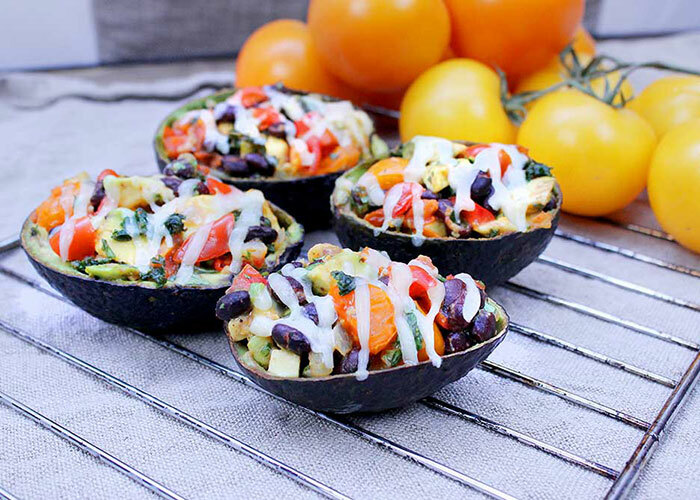 Stuffed avocados make a perfect lunch. Black beans, tomatoes and spices are paired with the creamy texture of the avocado for an amazing combination of flavors. Served warm, it provides a very satisfying meal or it can be paired with your favorite entre. Sauté the onions in olive oil in a saucepan over medium heat. Add the garlic, tomatoes, kale and cumin. Sauté until tomatoes and kale are soft. Add the cayenne (if using) and the black beans and heat through. Remove from the heat and add lime juice and cilantro. Season with sea salt and pepper to taste. Cut the avocados in half. Remove the pit and scoop out the meat, leaving the shells intact. Cut the avocado meat into chunks and add to the tomato mixture. Mix. Scoop the mixture back into the avocado shells, mounding the mixture. Top with your favourite cheese and place under the broiler to melt the cheese. Serve. Tip: This make a great lunch or side dish with dinner. Sent me a shopping list Are you an AnyList user? To prep this dish in advance, dice the remaining sweet pepper tops and store leftovers in the refrigerator or freezer for use in other dishes. Hummus and Feta Sweet Peppers are a tasty, healthy appetizer to serve at holiday parties, family get-togethers or a for a fun snack. Veggie burgers are a great way to increase your recommended daily vegetables. With sweet chili sauce, mushrooms and black beans this burger is sure to satisfy. You can never go wrong with a stuffed pepper, especially when it includes bacon. We’ve added in some kale for the extra bit of greens and color, and lots of cheese and tomatoes. Go ahead, dig in! All of our recipes can be saved to AnyList using the iOS app or supported browser extensions. How do I import a recipe from the web inside the AnyList iOS app? How do I import a recipe directly from other iOS apps like Safari?